In a bowl mix cheese, garlic, breadcrumbs, parsley, salt and pepper. 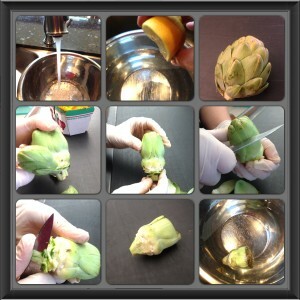 Open the leaves of the artichoke and fill each layer with the crumb mixture. In a shallow pan, bring to a boil 1 inch of water. Place the artichokes in the pan, drizzle the top of each artichoke with olive oil. Cover, reduce the heat to low and allow artichokes to steam. Check occasionally to ensure that the water has not completely evaporated. Add water if necessary. 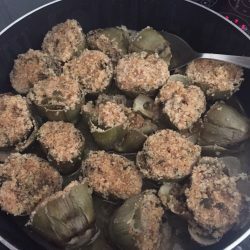 The stuffed artichokes are done when a leaf can easily be pulled off. Serve as a beautiful side dish!